I am scheduling an elective surgical procedure. What can I do to reduce the risk that I will be the victim of a hospital mistake? ?What can I do when I am hospitalized to protect myself from hospital negligence? ?I am scheduling an elective surgical procedure. What can I do to reduce the risk that I will be the victim of a hospital mistake? Doctor visits and hospital stays are always a little frightening. Patients get nervous about the diagnosis they may receive, whether required procedures will be painful, and whether they will have the courage to ask the right questions. One thing they shouldn’t have to worry about is whether the doctor or medical staff will make a mistake that will result in further harm or even death. Unfortunately, hospital mistakes are all too common and it is in your best interest not only to worry about it, but also to take action to reduce the risk of becoming a victim of a medical mistake. Choose your hospital carefully. Do a little research to find the hospital in your area with the lowest rate of patient infections. Studies show that over 31,000 people die each year from infections they acquired after checking into a hospital. Ask your referring doctor, call the hospital, or do an Internet search for the most recent data. Avoid Fridays. Doctors themselves recommend avoiding Fridays, particularly Friday afternoons, for elective procedures. 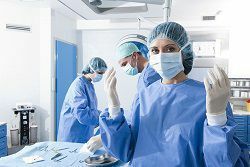 Just like everyone else, surgeons and nurses are a little less focused and more tired at the end of the week. Avoid weekends. Hospitals can be understaffed on weekends, labs are often closed, and most doctors are on call and will take time to get to the hospital. Obviously, you can’t stop a stroke or heart attack from happening on a Sunday afternoon, but if it’s not an emergency, wait until Monday. Don’t take the first appointment of the day. When scheduling an elective procedure, try to get the second or third opening for the day. Staff is alert and focused and any shift-change issues will be worked out by then. Again, emergencies should always be taken care of immediately, but when you do have control over the situation, assert yourself and make sure you get the care you deserve. If, despite your best efforts, you come out of the hospital worse than you went in, you may have a case for hospital negligence. At Tapella & Eberspacher, our attorneys are knowledgeable and experienced when it comes to hospital litigation. Contact us now to see if we can help you.